BARANGAY Ginebra is leaving nothing to chance with Greg Slaughter recently sidelined with another injury. 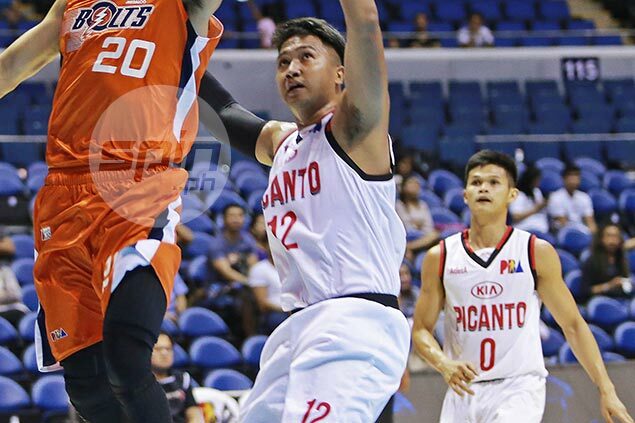 The Kings acquired big man Prince Caperal from KIA after the Picanto decided to relegate the 6-foot-7 center from Arellano to the unrestricted free agent list on Wednesday. KIA management confirmed the move to SPIN.ph shortly after losing a close contest to TnT Katropa, 90-85, in the PBA Philippine Cup at the Mall of Asia Arena. Caperal was put in the free agent list following the return of sophomore big man Russel Escoto to active duty. He's expected to play his first game with the Kings this Saturday against NLEX. The Kings’ acquisition of Caperal obviously is an insurance to the current health status of the 7-foot Slaughter, who failed to play for the team’s last three outings due to a strained hamstring. Ginebra went 1-2 in those three games without their resident big man. Slaughter, 29, just came off an ACL injury last season but returned in full strength in the Governors Cup to help the team retain its title against Meralco Bolts in the finals. He just played three games in the season-opening all-Filipino conference before being the injury bug hit him again. Ginebra is likewise without veteran big man Joe Devance this season as he continues to recuperate from off-season surgery on his ailing foot, which all the more makes Caperal’s arrival come in handy. A second round pick (17th overall) in the 2014 draft by Globalport, Caperal played for just one season with the Batang Pier. In 2015, he was shipped to Ginebra for veteran big man Dorian Pena, but was quickly dealt to Barako Bull (now Phoenix) together with Mac Baracael. After two seasons with Barako, Caperal found himself playing for Kia following a trade involving then rookie Joseph Eriobu.